TOUR DESCRIPTION: The Kanaio/Molokini tour is one of the most popular adventures because it combines the opportunity to explore a rarely seen and uninhabited part of Maui, the volcanic Kanaio Coast, with a variety of remote exotic snorkeling sites, including both spinner dolphin and green sea turtle habitats, and the famous Molokini Marine Preserve. Kanaio Sea Caves - Passengers can expect a rare treat as they tour along Maui's Gold Coast past Wailea and Makena to a remote and inaccessible coastline with spectacular views of the slopes of Mt. Haleakala. About 200 years ago at Kanaio, molten lava exploded from a side vent and poured intoo the ocean, forming incredible lava arches, grottos and sea caves. The experience of viewing a volcanic sea cave, or passing through a massive lava arch, should not be missed! Dolphins Ahead! Following Kanaio, you will cruise to the protected waters of La Perouse Bay, frequently encountering a school of spinner dolphins including babies, along the way or in the bay itself. Named for their acrobatics, these playful mammals will frolic in the wave produced by the boat, sometimes only an arm's length ffrom the bow. Many times, the dolphins will come and visit and may decide to swimm with the snorkelers. This experience has been described as spiritual and is a visual and auditory experience that one never forgets. A continental breakfast is served around this time and a remote snorkeling site may be offered such as the La Perouse pinnacle which is teeming with fish. MOLOKINI CRATER - After departing La Perouse Bay, you'll head for Molokini, a short 20 minute ride from the bay. You will see up to three unique sites including the inside rim, the outer reef and the backside of the crater. By this time of day conditions at Molokini are generally calm, yet most of the bigger boats have departed or are departing leaving plenty of room for uncrowded snorkeling. Drift snorkeling the outer reef is one of the many highlights of this tour. Imagine snorkeling one of the most beautiful submerged coral reefs in the world drifting gently along with the current as your boat follows nearby for your safety. Glide past a vast variety of butterfly fish, wrasses, black and pink-tailed durgeons, all posing against a backdrop of beautiful coral only 3 feet below. Truly a photographer's dream! For an exciting panoramic view, venture over the edge to witness an awesome 200 ft. drop. It's like looking off the edge of the world! Backside - time and conditions permitting, another drift snorkel may be offered on the backside of Molokini, a favored dive site for advanced scuba divers. The depth here is about 300 ft. but the lighting and the view of the vertical wall of rock, coral and fish is phenomenal. This site may be also offered as an alternative to the inside under certain sea conditions. 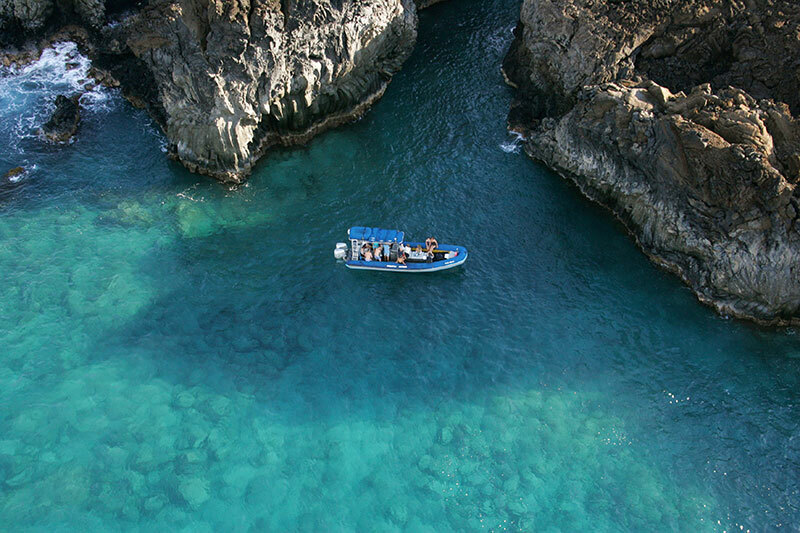 Departing Molokini you'll make one more stop in Makena with a delicious buffet lunch and snorkel with sea turtles and spotted eagle rays near pristine lava fingers. These turtles although endangered and protected are accustomed to seeing snorkelers and do not mind being photographed as they surface for air just a few feet away. The variety of scenery and woldlife encountered both above and below the surface truly make this tour one of the most comprehensive snorkeling adventures available on Maui! !